C osen Saws, Charlotte, NC, a manufacturer of industrial band saws, has introduced Mechalogix Cosen Predictive Computing—a cloud-based system that includes an innovative feature that monitors the performance of a blade and can accurately forecast the number of remaining cutting hours left before breakage or before a saw blade dulls and is no longer cutting with precision. 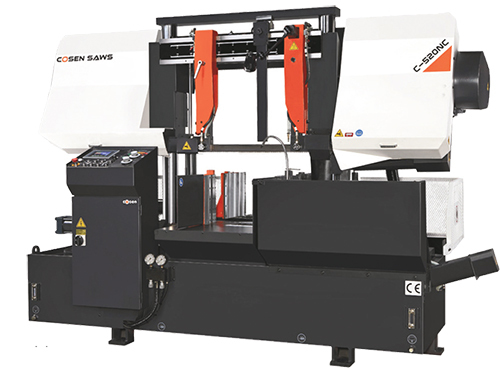 “Know the unknown—now you can,” says Joshua Sun, business development manager for Cosen Saws. “This completely changes the game for cloud-based machine monitoring systems. Our customers have told us how important it is for them to minimize waste and scrap. Having a blade fail in the middle of a cut is one of the primary causes of waste and scrap and it negatively impact profits. Mechalogix provides real-time performance data and can report issues such as excessive vibration, overheating and changes in fluid-line pressure. The root cause of an issue is reported in real time, which equates to minimal down time and more efficient operations, according to company officials. The technology is intuitive and user-customizable. Adjustable alert settings work seamlessly with the mobile app. “We have been delighted with the enthusiastic response from our customers who have partnered with us during the course of the program,” says Sun.